Dubh Linn – The black pool. Doolin lies on the south-western extremity of the Burren and is internationally renowned as a centre of live Irish music, played in its many hugely popular pubs. It has a wide range of accommodation, and good quality restaurants. Popular all year round, most of the activity in the village focuses on the original areas of ‘Fisherstreet’ and “Roadford”. Doolin is an excellent base for exploring the Cliffs of Moher, Doolin Cave (Poll an Ionáin) as well as the Burren and its Atlantic coastline. 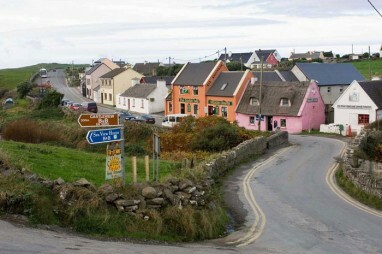 Doolin is also popular as the departure point for the Aran Islands Ferry, and Cliffs of Moher Cruises. Doolin (Dúlainn in Irish) is a coastal village in County Clare, Ireland, on the Atlantic coast. It borders the spa town of Lisdoonvarna. There are numerous nearby archaeological sites, many dating to the Iron Age and earlier. Doonagore Castle and Ballinalacken Castle are also in the area. One of Doolin’s claims to fame is that it is the main setting for the PlayStation 3 game Folklore. According to the game’s storyline, the Netherworld, the world of the dead is a realm that can only be accessed from one place in the world, the sea-side village of Doolin. 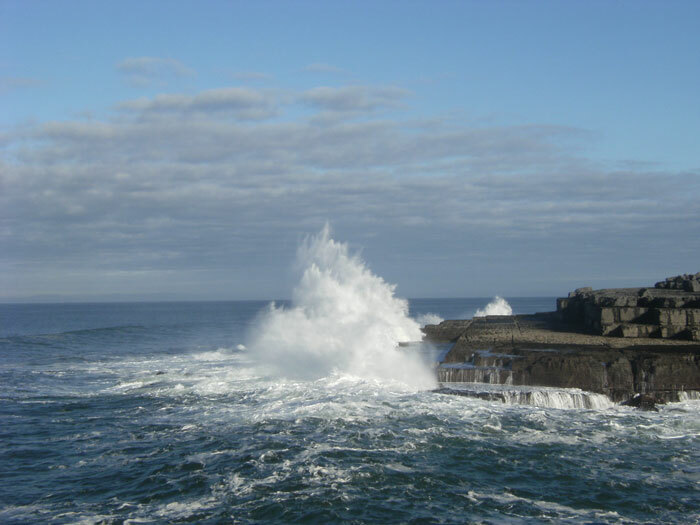 Doolin is one of three places (Galway and the village of Rossaveal on the northwest shore of Galway Bay are the others) with ferry services to the Aran Islands, which are visible from the town. 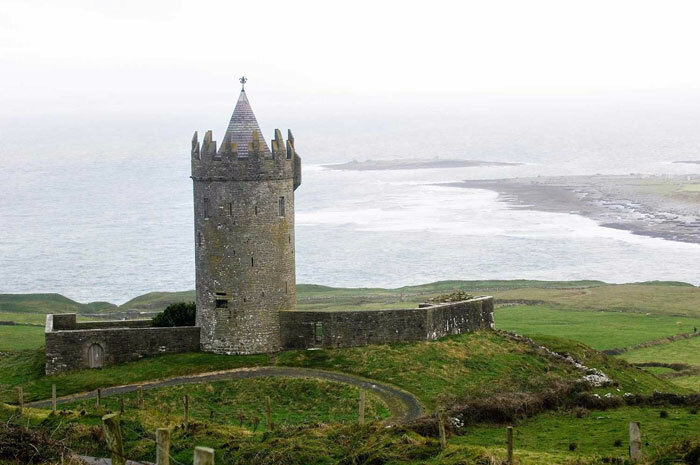 Doolin is also close to the Cliffs of Moher, and a bus service between Galway and Limerick/Ennis calls at both Doolin and the cliffs in each direction. The area is at the south-western corner of the Burren region. Doolin Cave is one of Europe's most compelling cave attractions. It is a truly authentic experience. It is your only opportunity to see such a large free hanging stalactite anywhere in the world. 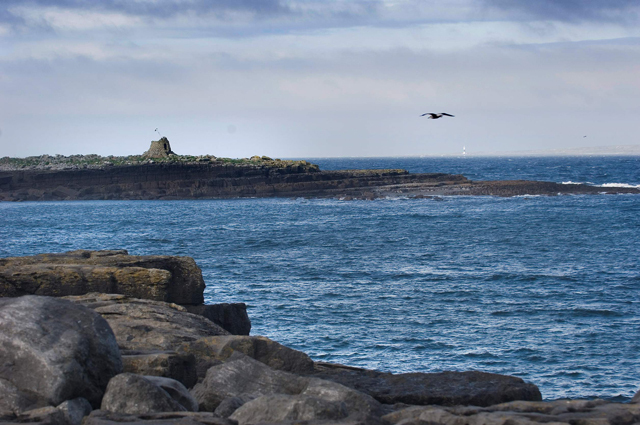 The North Clare Cycle Network, with the town of Doolin – centre of traditional Irish Music in Clare – as its hub, offers four new cycle routes varying in distance from 18km to 47km with numerous shorter alternatives. Each cycle offers wonderful views of the local countryside with stunning coastal panoramas. There are numerous stop-off points along with the routes with excellent restaurants, pubs and other facilities and services. 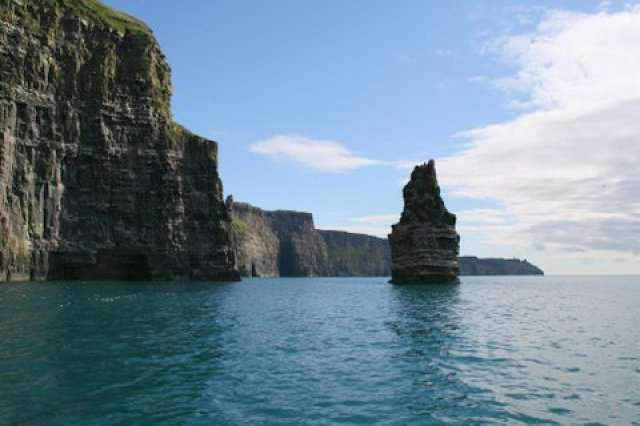 Loop 1 is the shortest tour (18KM – takes 1.30-2.00 hours), it goes from Doolin south towards the Cliffs of Moher. Loop 2 (26/39KM, takes 3 to 4 hours) visits the south west corner of North Clare taking in some amazing coastal views. Loop 3 (43 KM, takes 4 to 4.30 hours) guides cyclists inland towards Kilfenora and the Burren Region. Loop 4 (21/47KM, takes 4.30 to 5 hours) takes cyclist north from Doolin along the coast road with spectacular views of the Aran Islands. Walk the limestone pavement on the edge of the Wild Atlantic Way. Ferries to the Aran Islands run daily throughout the summer from Doolin Pier. Doolin Pier is a Geosite. Our spacious tea rooms are located in the Doolin Cave Visitor Centre, serving home-made soups, light meals, cakes and desserts, as well as a wide selection of hot and cold drinks. Our philosophy is simple... serving delicious, carefully prepared, simple local food that is in season therefore supporting local food producers. Traceability and integrity in our food is important to us. We use organic and free range food and ingredients where possible. Eggs are collected from our happy hens who roam freely here and we bake our own soda breads, cakes and pies. The Garden Cafe menu changes daily depending on fresh local and in-season ingredients that are available to us. As part of our eco-tourism policy and belief in the importance of sustainable tourism we use local ingredients including world famous smoked salmon from the Burren Smokehouse in Lisdoonvarna and beautiful home-made preserves from the Clare Jam Company. The Garden Cafe at Doolin Cave gives our visitors a real taste of the Burren. Cafe open all day from 10am - 5pm for coffee, tea, cakes. Doolin Cave is one of Europe’s most compelling cave attractions. It is a truly authentic experience. It is your only opportunity to see such a large free hanging stalactite anywhere in the world. From the moment you descend over 80ft into the first tunnel, with your guide, you will enter a world carved by water. Donning your hardhat, you will follow the rough-hewn route of the early explorers who first discovered the cave. When you enter the stunning, cathedral-like dome that houses the huge stalactite, you will be briefly plunged into a world of primitive darkness. Then, in a flash, you will be awed as the subtly-lit stalactite appears before you. And, far below, a magical stream carries to the hills outside, the water that carved the primeval world around you. The cave tour takes 40-45 minutes. The cave is open, 7 days per week form 10am – 5pm. Gus O’Connors is one of the most famous pubs in Ireland, located in the heart of Doolin, on the Wild Atlantic Way. Open each morning for breakfast at 9am, Lunch starts at 12pm and food is served all day, last orders at 9:30pm. The menu has a backbone of traditional Irish fare using fresh produce whether it be locally reared Irish beef or fish straight from the sea. Music sessions kick off around 9pm each evening during the summer and last till late, and Sunday evenings at 6.00pm. All are welcome to join in! Hotel Doolin is the ideal venue for your Wedding Banquet. From a simple reception to an elaborate banquet or an outdoor marquee wedding, our services and facilities can be tailored to your requirements. The Hotel has a new range of Wedding Packages Wedding Packages at Hotel Doolin. StoneCutters is a 100-year-old traditional stone built cottage with a flag stone roof, tastefully transformed into a small, unique mid price range, family oriented restaurant. Everything on our menu is home-made with the emphasis on good food, excellent service & good value for money. The restaurant specialises in catering for families with children, serving delicious home-cooked meals,full children's menu, toys for the kids to play with and a playground in the garden. Hostel / B&B + Coffee Shop in the centre of Doolin at the Bus Stop, at the start of the Cliffs of Moher hiking trail, 100m to O'Connors Pub, 1km for Aran Island Ferries. In the heart of Doolin, overlooking the village and out to Sea. Located at the Bus Stop and at the start of the Cliffs of Moher Coastal Hiking Trail. A 2 minute walk to the famous O'Connors Pub, a 15 minute walk for the Aran Island Ferries and Cliffs of Moher cruises. An ideal location for exploring the Burren with its lunar landscape, megalithic tombs, forts and castles or taking part in one of the many great adventures that await you. -Café (April to October) with great coffee, home baking and Irish Craft Beers. -We do not accept Stag, Hens or similar parties. -Luggage Storage on day of departure if required for our guests. -Extra storage available for large activity equipment. -Standard and Superior rooms, ideal for individual explorers, families and adventurers. -A stove fire and a glass of wine to recant your days adventures over. -Feel like beans on toast our kitchen awaits your culinary genius or pick up a snack in our cafe. -Feel like eating out then just walk down to the local pubs or restaurants that are on our doorstep. Enjoy the convenience and meeting others in a hostel atmosphere, the individual attention given by a B&B, the comfort of a quality hotel mattress and a great cup of coffee from your favourite coffee shop in the morning. Doolin Hostel is also a haven for activity enthusiasts and a great base for Rock Climbing, Bouldering, Caving, Sea Kayaking, Mountain biking, Hiking the Burren Way, Cycling the Doolin Cycle Hub, Coastal Walks, Horse riding over the Burren and much much more..
Sea View House in Doolin is unique bed and breakfast where you can enjoy luxurious accommodation and surroundings, superb food along with natural and warm hospitality. Sea View House offers a retreat from the hustle of everyday life. Open decks, pastoral and ocean views form a setting for relaxation or lively conversations. 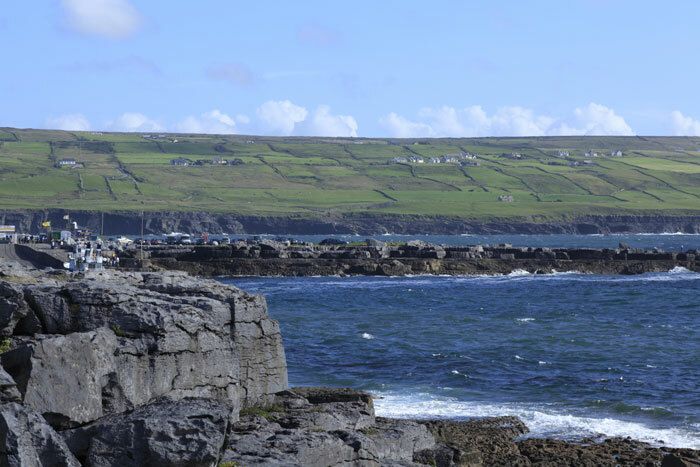 Our home is perched on the side of a hill in Doolin village over looking the Atlantic Ocean and the Aran Islands. Located on the Burren Way and over looking the Atlantic Ocean and the Aran Islands, we are right in the middle of Doolin village allowing you to stroll across the bridge to Gus O’Connor’s pub where you can enjoy wonderful traditional live Irish music and great food. The spectacular coastal walking trail linking the village of Doolin to the Cliffs of Moher and on to Hags Head starts right outside Sea View House. We can offer you peaceful accommodation in one of our four spacious and elegant non-smoking guest rooms. Each stylish bedroom is finished to the highest standard and all rooms feature classic hand-made mahogany furniture. Complementary WiFi is available in our bedrooms and throughout our home. Our guest rooms are complemented by our guest lounge and large deck both where you can soak up the glorious views of the Atlantic ocean, Allie river and Doolin Village, take time to watch a passing ship or enjoy the evening sunset. Sea View House has gained recognition for our use of locally sourced and homegrown ingredients for our breakfasts. You can choose from our sumptuous breakfast buffet of home-poached fruit’s, artisan cheese, home made yoghurt and much more before being served a low food mile dish prepared to order from our kitchen. We source as much locally as we can. 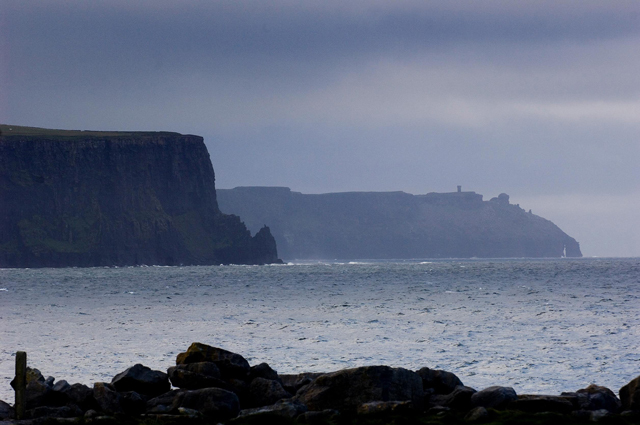 Our cheese comes from the Cliffs of Moher and Buren Geopark. We grow our own tomatoes; bake all our breads, and all our eggs come from our flock of chickens.